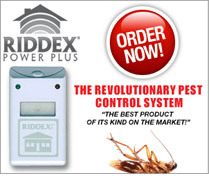 Summary: Riddex Plus has been so successful removing pests for the past 12 years that over 3 million have been sold. Patented electromagnetic technology repels unwelcome mice, roaches and other vermin without killing them – a humane way to get rid of pests. No more expensive treatments, no fumes, no mess, no traps or poison. Safe for electronic equipment. Riddex Plus is so safe, it’s listed with Underwriters Laboratories, the Environmental Protection Agency, and is fully compliant with the Federal Communications Commission.